LIVERPOOL (SportingAlert.com) — Liverpool FC have announced the signing of England international Adam Lallana from Southampton. The 26-year-old who was a member of England’s World Cup team this summer in Brazil, became the third signing of the summer for Liverpool after passing a medical at Melwood and the midfielder is looking forward to playing for the Reds. “I’m so excited for the next chapter of my career, coming to a special club like Liverpool,” he said on www.liverpoolfc.com. “I’m quite humbled and I just can’t wait to get started. “Hopefully I can settle in quickly, and I will give it my best throughout the whole time I’m here. Lallana, who made 250 appearances for Southampton between 2006 and 2014 and scored 58 goals, joins Rickie Lambert, who has also joined from the Saints and Emre Can, who joined the English Premier League runner-ups from German side Bayer Leverkusen. Liverpool manager Brendan Rodgers is also delighted to land such a talented youngster and is confident he is a perfect fit for the current squad. 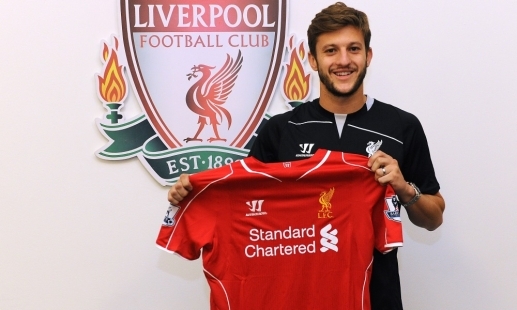 He said on www.liverpoolfc.com: “We are delighted to have secured the services of one of the Premier League’s top talents in signing Adam Lallana,” the boss told Liverpoolfc.com at Melwood. “What is apparent about Adam is that his character is on a par with his talent. “He is an exceptional young man and someone who has a love for the game – and, most importantly, a desire to progress and improve.